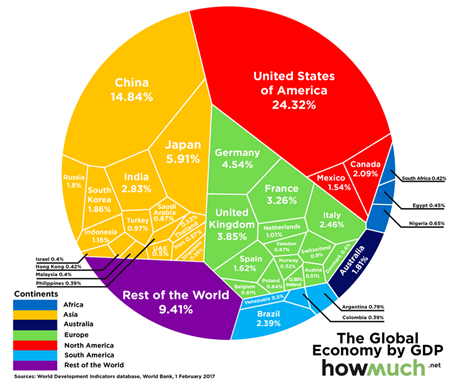 Take a look at this chart of the wealth of nations. This chart indicates just how dominant the United States of America is economically. Whenever you hear about the decline of the United States in terms of productivity, especially manufacturing, please keep in mind this chart. China is catching up in terms of gross productivity, but in terms of productivity per capita, it is still a backward nation. At least two-thirds of China’s population lives on poverty-stricken small family farms. It is still a village economy. It is going to take decades for those people to drag themselves out of a level of poverty that Americans have not seen for two centuries. Per capita output of the United States is high. Given the size of the country, which is either number three or number four in the world, per capita output of the United States is mind-boggling. China, India, and Indonesia are backward societies economically. If we count the European Union as one country, then the EU and the United States are close. The West, meaning the West above the equator, is still dominant, and shows few signs of falling behind. In 1950, when I was in grade school, the United States accounted for about 28% of the world’s economic production. Western Europe was barely recovering from the effects of World War II. Western Europe has caught up. This chart is based on figures supplied by Angus Maddison. Among economic historians, no one argues with his figures after 1820.